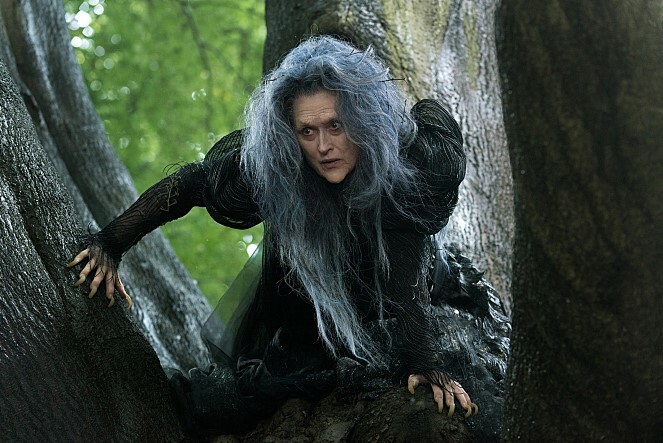 Into the Woods (2014) ☆☆1/2(2.5/4) : So they learned lessons…. In the era where modernization or deconstruction or any kind of reinterpretation of fairy tales has been a usual thing at movie theaters, “Into the Woods” has already lost some of the personality which Stephen Sondheim’s Tony award-winning musical once had when it was put on Broadway stage in 1987. As far as I remember, each fairy tale section in the musical got at least one modern treatment during last 27 years, and even its irreverent juggling of fairy tales has lost novelty since “Shrek” (2001) and its sequels. While Sondheim’s songs are still nice enough to hum after you listen to them, “Into the Woods” is a passable musical adaptation which sometimes feels deficient during its key musical scenes. I was amused by several humorous touches in the story as enjoying the songs, but the movie becomes sagged at times due to its incoherent pace, and then it becomes less interesting when things get darker around its third act. It ultimately closes its curtain with a whimper, and we walk out of the screening room without much to remember. 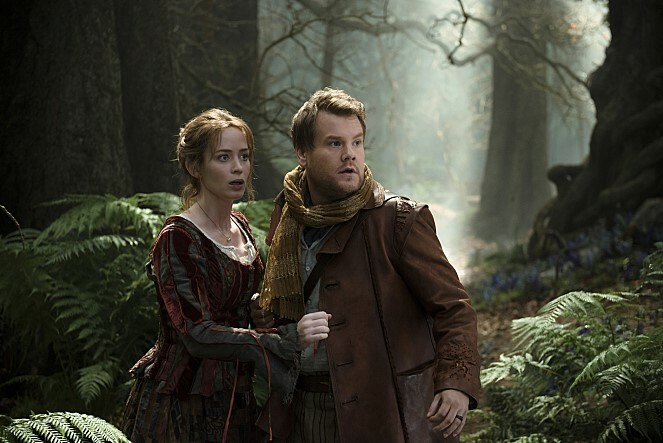 Starting with its opening number, the movie introduces various characters who will get more than what they wish for: Little Red Riding Hood (Lilla Crawford), Jack (Daniel Huttlestone), Cinderella (Anna Kendrick), and Baker (James Corden) and his wife (Emily Blunt). While Jack wishes his cow can give milk, Cinderella wants to attend a party at the palace like her wicked stepmother and mean stepsisters, and Baker and his wife have been hoping for having a baby someday. In case of Little Red Riding Hood, well, this plucky little girl has no big wish for now, but she freely takes Baker’s breads just because she wants breads for her grandmother – and her, of course. And we meet Witch (Meryl Streep), who lives next door to Baker and Baker’s wife. During her loud surprise visit to Baker’s house, she explains why they have failed to have a baby for years. Once upon a time, Baker’s father broke into the Witch’s precious garden for getting fresh vegetables Baker’s pregnant mother craved for, and he inadvertently caused the unfortunate transformation of Witch, who became uglier than before as a consequence. Witch naturally became furious about this unintentional damage, so she punished Baker’s father in two ways; she took away Baker’s newborn baby sister and has locked her in a tall tower where there is only one way of access (guess what her name is? ), and she also put a curse of infertility on Baker’s family. But there is still a chance to break the curse, so Witch gives our young couple a deal they cannot refuse; there are four necessary items for the magic potion she needs, and they must bring them to her within three day’s time. As Baker and his wife enter the woods, other main characters also go into the woods with very items Baker and his wife seek for. Wearing that famous red hood of hers, Little Red Riding Hood merrily walks into the wood, and she soon encounters a big bad wolf played Johnny Depp, who has a little insidious fun with his nefarious character during his brief performance. Meanwhile, Jack leaves for the town to sell his dear cow as demanded by his mother (Tracey Ullman), and then he happens to come across Baker in the woods. In exchange for Jack’s cow, Baker gives Jack the beans his father stole from Witch, and he lies to Jack that they are magic beans. Of course, as we all know, they are really magic beans, so we soon see a giant beanstalk which has grown up to somewhere in the sky, and, not so surprisingly, more than one giant appear later in the story. In case of Cinderella, she gets a chance to attend the party with her golden dress and slippers thanks to her dead mother’s spirit, and then she finds herself eagerly pursued by a prince played Chris Pine, who gets his own amusing moment when his character comes across another prince charming in the woods. They sing “Agony” together in a hilariously self-absorbed way, and that certainly makes their prince charming characters less boring than usual. The more the characters go around here and there in the woods, the more the movie meanders as sometimes stopping for another song to be performed, and I was reminded again of why some of stage musicals are not very easy to be translated on the screen. It may be enough only with music and performance on the stage, but something more is required on the screen as our eyes depend on camera and editing, and the movie does not provide much in that aspect. For instance, a certain scene was clearly intended to be a dramatic showstopper during the last act, but it merely functions as one main character’s perfunctory exit in the movie, and the camera simply shows the character performing the song with no particular effect. The actors in the movie acquit themselves fairly well as singing in front of camera. James Corden and Emily Blunt hold the ground with their likable performances, and Meryl Streep, who previously showed her musical talent in “Mamma Mia!” (2008), did a nice job on a couple of main songs with gusto and campy makeup. While Anna Kendrick brings some cheerfulness into her princess character, young actors Daniel Huttlestone and Lilla Crawford are solid in their delivery of Sondheim’s lyrics, and Christine Baranski, Lucy Punch, and Tammy Blanchard have a vicious moment of dark humor as their mean supporting characters try to block Cinderella’s path to her prince. The movie was directed by Rob Marshall, who previously directed Oscar-winning film “Chicago” (2002). That musical film was a good fun despite its imperfect presentation of musical scenes, and it was mainly because of the spirited energy generated from its story and characters. Compared to “Chicago”, “Into the Woods” feels thin while being less enjoyable on the screen, and I felt more distant to what was going on the screen as feeling more coldness during the screening I attended in this morning. They learned lessons in the end, and so did I. This entry was posted in Movies and tagged Fairly Tale, Fantasy, Musical. Bookmark the permalink.